Last June the 15th Conic System and Liaoning Yinong Agri-Tech Co. signed the agreement to cooperate to promote the CONIC SYSTEM range of machines in China (Seeder Lines, Irrigation Booms, Trays Washing Machines Ultralow Volume Nebulizers, Grafting Lines, etc.). For more than 30 years, CONIC SYSTEM acquired quite a long experience to design and produce such a machines, and can be well commercialized worldwide to help the Horticultural Nurseries to upgrade their technology. Liaoning Yinong Agri-Tech Co. the CONIC SYSTEM distributer in China, being also a group of Nurseries, already installed a Grafting Line and the NEBULA (Ultralow Volume Nebulizer) 4 Nurseries make up the group, all it in the Liaoning Province (Northeast of China), 2 in Tieling, 1 in Hurutao (Suitzong) and another in Dalian, the main harbor in the Province. In one of the Nurseries in Teiling, they have a Show Room (they call it “factory”) where the CONIC SYSTEM machinery can be seen. The weather there is a Continental with very hot summers and extremely cold winters (arriving to -30ºC) but sunny. In every site they have 2 kind of Greenhouses, the first as a Nursery to produce seedlings and the second, called Solar Greenhouses, as a grower site to produce vegetables. Liaoning Yinong Agri-Tech Co. produces millions of grafted seedlings, Eggplants, Tomatoes, Cucumbers, Pepper, with the CONIC SYSTEM GRAFTING line they produce up to 2500 plants per hour with 6 workers. 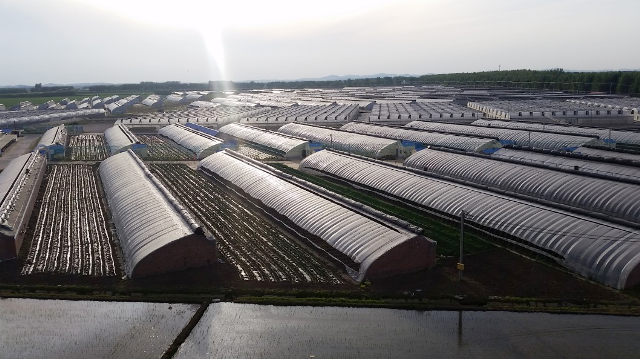 In the Solar Greenhouses they grow the seedlings that they not sold and also strawberries and other plant to be commercialized to the whole China or sold when they open their doors to let the people living around to pick themselves up their vegetables.